Silver Dolphin Books, 9781684127474, 32pp. Peter wants a perfect little pig for a pet. Not a bad little pig, and not a good little pig. Peter wants a good little bad little pig! So his mom sends the farmer a letter. Does Peter get what he asks for? 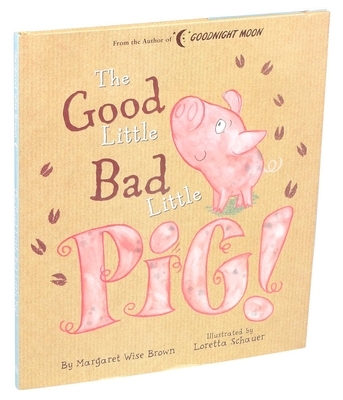 Find out in this classic treasure from Margaret Wise Brown, author of the children's classics Goodnight Moon and Runaway Bunny. Loretta Schauer originally trained as a dancer, and then managed a conservation charity on Hampstead Heath for many years—battling brambles by day and practicing her drawing skills by night. Loretta won the Waterstone's Picture This competition in 2011 and has since illustrated numerous picture books, including Beauty and the Beast written by Michael Morpurgo, A Monster's Moved In! written by Timothy Knapman, and the new Sky Private Eye series of picture books written by Jane Clarke. Loretta has also illustrated several young fiction titles including the Dougal Daley series written by Jackie Marchant. She has worked with a range of publishers including HarperCollins, Little Tiger Press, and Bloomsbury, and is currently writing her own picture book stories and a fiction series for children. She lives in London at the top of a tall grey building with her husband and pet hamster, Torben Redbeard, and occasionally escapes to go galloping around the Heath, or noodling for fossils.